Save those ordinary plastic mesh berry boxes that are used to store and display strawberries, blackberries or raspberries in the grocery store. They look lovely when you decorate them with yarn, ribbon or lace for Easter or any other special occasion. 1. Cut a length of weaving material long enough to go all around the box, with an inch or two to spare. Start weaving from one bottom corner, going from left to right, and weaving the material under and over the mesh spines of the box. If desired, you can vary the weaving pattern – try going under one spine, and over two, or the reverse. Continue weaving until you get back to the starting point. Make sure the material begins and ends on the inside of the box. Cut off any excess material. Apply a little glue to the back of the material and press into the corner to secure. 2. Following the directions above, weave as many rows as needed to completely cover the sides of the basket. 3. Cut a narrow strip of cereal box cardboard, or similar cardboard, to make a handle for the basket. Decorate the handle with paint or cover it with ribbon. Apply a generous amount of glue to each outside end of the handle, then curve the handle to fit across the middle of the basket. The pressure of the curve should press the ends against the top inside of the basket until the glue dries. 4. Cut a length of pregathered lace to fit around the basket rim. Apply glue to the rim then press the top hem of the lace into place, beginning in one corner and proceeding all the way around. Overlap and glue down the ribbon ends to finish. — Make the handle from a length of wire-edged ribbon for a softer effect, or chenille stems braided together. — Embellish with craft foam cut-outs or fabric paint. 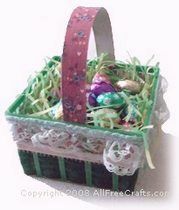 — Line the basket with crumpled tissue paper, quilt batting or shredded paper instead of Easter grass.